A RAINY HOLIDAY IN PHUKET! While holidaying in Phuket I learnt the hard way that you never really know what kind of weather you are going to get. It could rain for the day, or on and off with the occasional pass of a cloud, but I made it my mission not to let it stop me from enjoying my trip. Luckily a lot of companies allow you to postpone tours because they themselves don’t know how the weather will turn out – but some establishments still continue throughout the rain. Thai Massage: these are usually done without oils, and in some comfortable silk pyjamas – often thai massages take place in private room divided by curtains with dim lighting if not none. Thai massages entail a relaxing, yet more energizing than most forms of massages. A popular comment made is that thai massages are like doing yoga without any work. Get bent in all different directions with a Thai Massage that leaves every joint cracked and every knot ridded of. Milk baths: can you really leave Phuket without taking advantage of one of the beautiful milk baths filled with flowers? An irreplaceable experience is to get a scrub and massage treatment, which consists of being covered in a body scrub, then relaxing in a milk bath, and finishing off with an oil massage. One to take the family to, Phuket’s Trickeye Museum is an experience that will fill up your photo albums. ‘Museum’ probably isn’t the best term, as it is an interactive experience with 3D paintings that offer unique photo opportunities. You’re on an island that is pretty well known for is snorkelling opportunities, so if it’s raining, why not get a better look at the fish? The recently renovated Phuket Aquarium is a great place to take the family, and gives the kids a chance to run around in the underwater tunnels. Sure you’re probably thinking, why would I want to do the Phang Nga Bay tour in the rain? But once you’re out discovering caves and mangroves you’ll realise that Phang Nga Bay can be just as beautiful in the rain. Baan Teelanka, is the first and only upside down house in Thailand and is ideal for whatever you make of it – whether a stop-over destination or a place to take a relaxing stroll. With free WiFi, guests are able to stay connected to their social media and post some of the unique photos that the attraction provides. Most hotels are equipped for cooking classes so that travellers have the option to learn and make traditional Thai cuisines. Popular dishes to be made in cooking classes are; Thai Green Curry, Som Tam, and Tom Yam Goong. If you’ve already taken a stroll down Bangla Road by Patong Beach, you’ll realise just how popular thai boxing is. Exciting enough on TV, if you’re not going to attend a live showing, you can take a class. There are many training camps all over Phuket and all cater for different skill levels – from beginners to professionals. With provided transfers to and from your accommodation, the easily recognizable FantaSea vans pick you up allowing plenty of time to explore the park. Upon arrival you are welcomed by some incredible architecture including a fishpond with a mock up of the James Bond Island rock, a lit-up entrance and a golden ticket desk. After a traditional Thai buffet dinner – it is off to the show. With acrobatic performers swirling in the air above your seat, this is just one of the many things that will have you watching gaped-mouth. As well as magic tricks, tigers, chickens, an addictive storyline, and so much more – then the finale! Elephants standing on tiny tables, elephants standing on two feet, elephants standing on two feet IN ROWS… who even knew that elephants could move in that way? Phuket Town is a historical town that makes a part of Phuket City – it’s main street is Thalang Road which is home to cafes, bars and shops all within the traditional architecture that was constructed many years ago. So it pretty much says it in the name, but what are the chances you wouldn’t get wet when white water rafting? So adding a little rain to that could make it even more exciting. There are quite a few white water rafting establishments in Phuket, some which also include elephant trekking and ATV. 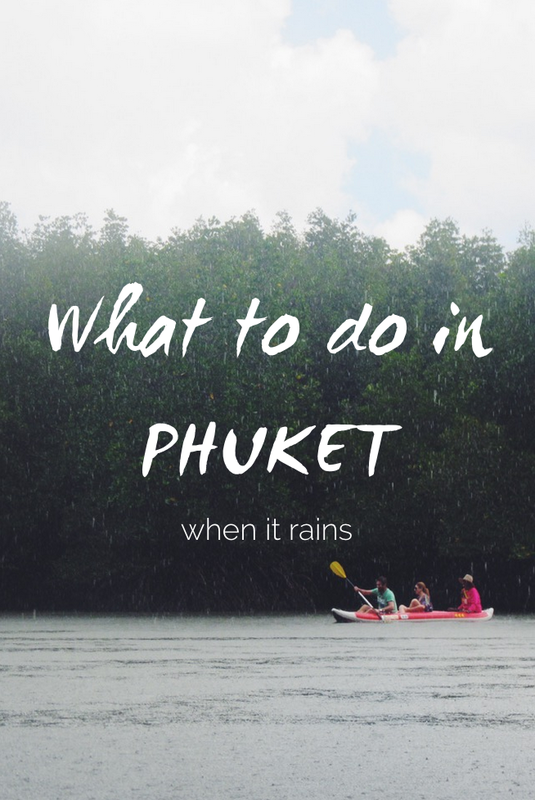 What would you do on a rainy day in Phuket?